Changchun Yatai star Odion Ighalo gave another recital of his offensive prowess with a brace and an assist in Nigeria's hard-fought 3-2 win against Libya on Tuesday evening in Sfax, Tunisia. His 14th and 81st minute goals took his total in the 2019 Africa Cup of Nations qualifiers to an impressive six goals from three matches, an average of two goals per game. The former Watford striker has scored more goals than all the African players involved in the qualifiers and all the Super Eagles players combined. Red Star Belgrade's Comoros forward El Fardou Ben Nabouhane and Anderlecht's Zimbabwe star Knowledge Musona are on four goals to place second. Six players have found the net three times for their respective countries, including Liverpool winger Mohamed Salah. 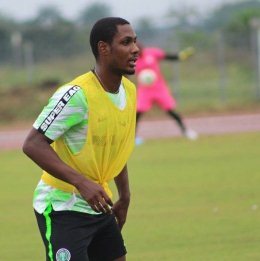 For three years now, the Super Eagles have never lost or drawn a match in which Ighalo found the back of the net, beating Cameroon and Libya on two occasions, Luxembourg and Seychelles. The senior national team netted at least three goals in the six matches Ighalo got on the score-sheet.